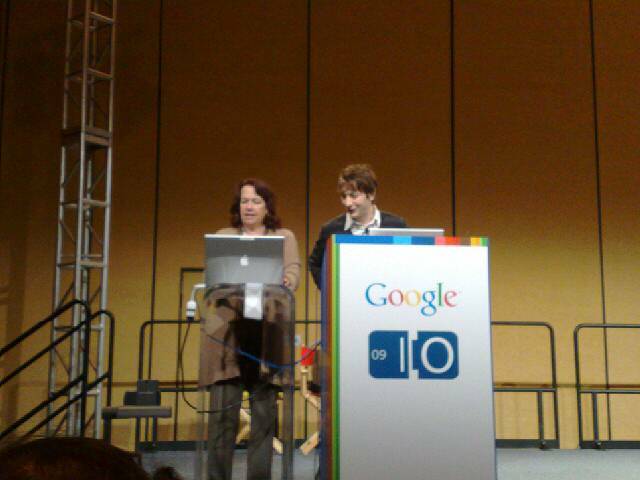 Here is my transcription of two sessions from Day 2, 05.28.09, of the Google I/O 2009. Per my usual, the following is a combination of live quotes from the speaker, notes off the slides, some paraphrase and a few of my own asides. So far, Brett Slatkin’s Offline Processing on App Engine: A Look Ahead has been my favorite of the day. Lunch conversation with Prashant and Bastian was delightful. Asynchronous: Why do work now when we can do it later? What is a queue historically? How do traditional task queues work? How is GAE task queue different? * Important for tasks to be run repeatedly without harmful effects, why necessary? Failure can happen at anytime. * Possible for a task to spuriously run twice even w/o server failures. * Why do you want to throttle? How to do a schema migration in GAE? With Task Queue: define handler to: query for next N entities…. Brett goes so fast that I have lost track…. This was a good session on touch screens and accessibility. Ms. Jen Note: Sorry, I didn’t take notes, as I was sitting on the floor and could not see the screen and most of it was demo, but I could hear the reader reading the interactions from the Android phone to TV Raman (who is blind). The reader sounded very similar to the JAWS reader. The voice reading is to be clearer in the next iteration of Android (aka “Donut”), according to Mr. Raman. Ms. Jen Note: I am sitting on the floor next to a power source for this session and may or may not get the best notes. by Ms. Jen on Thu May 28, 2009 | Permalink | moleskine to mobile, tech + web dev.